Toturi opened his eyes. On the far side of the tent, rising above the broken lion figurine on the floor, the Lion Clan mon flapped in a gentle breeze, golden and glowing in the firelight in fierce splendor. The world of Rokugan is wracked by conflict. Dark forces are stirring in the Shadowlands and tension builds between the clans—political machinations in the courts and skirmishes on the borders. Momentous events are brooding on the horizon, which will shape the fate and future of the Emerald Empire for years to come. In this time of trouble, a samurai’s clan is of paramount importance. 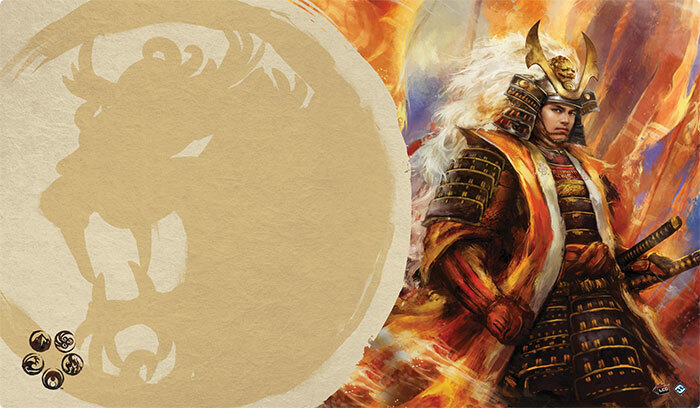 In just a few weeks, you can enter the world of Rokugan through the Legend of the Five Rings: The Card Game Core Set. Before you show up to your first tournament or weekly game night, however, you’ll want to make sure everyone knows which clan you’ve sworn to fight for. 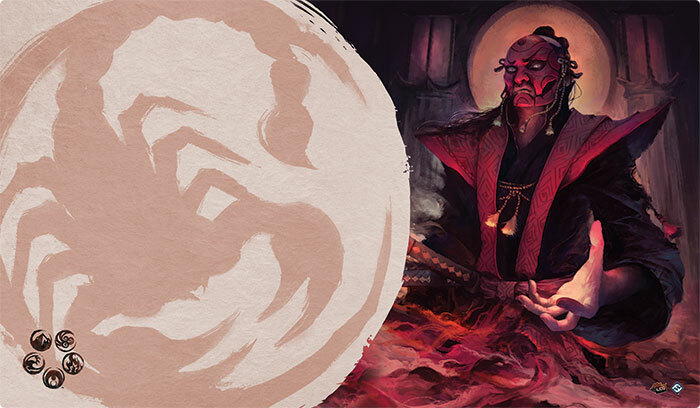 To that end, Fantasy Flight Games is proud to announce seven new Legend of the Five Rings playmats from Fantasy Flight Supply, now available on our website or at your local retailer! 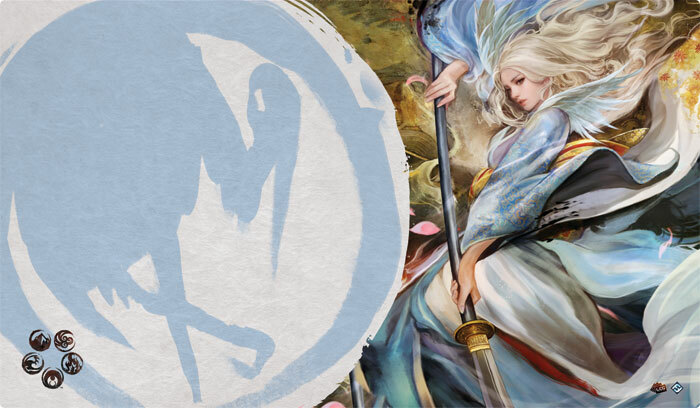 Whether you’re playing at the Fantasy Flight Games World Championships, or just around your kitchen table, these Legend of the Five Rings playmats are perfect for protecting your cards from stains or spills. 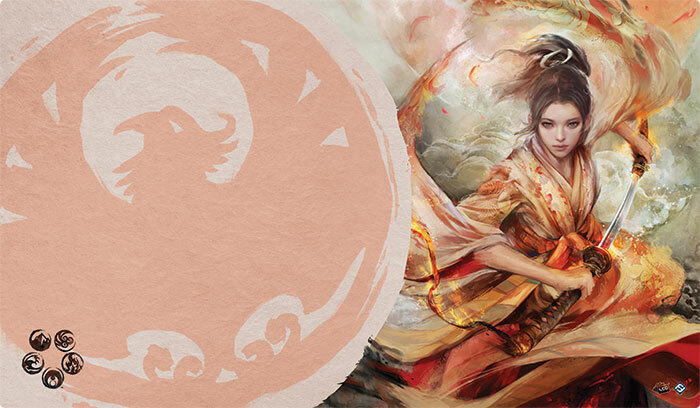 Each playmat features stunning art of your chosen clan’s champion and the clan’s mon, proudly proclaiming who you support among the seven Great Clans of Rokugan! 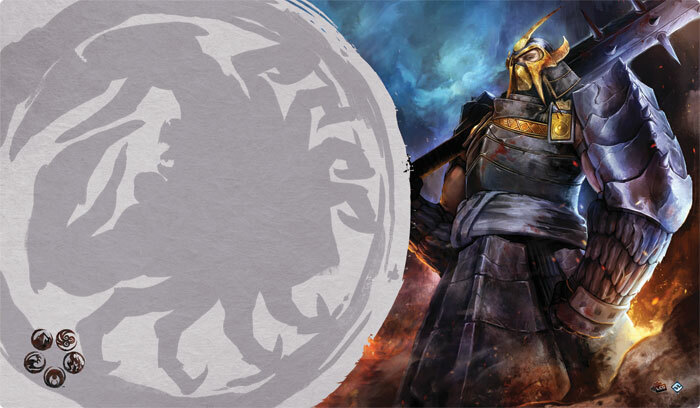 The Crane Clan are the Left Hand of the Emperor, a potent political force. Their clan is filled with artists, courtiers, and duelists, and as you fight alongside Doji Hotaru, you can lead the Crane to greatness. As the Crane Clan is to politics, so the Lion Clan is to the field of battle. 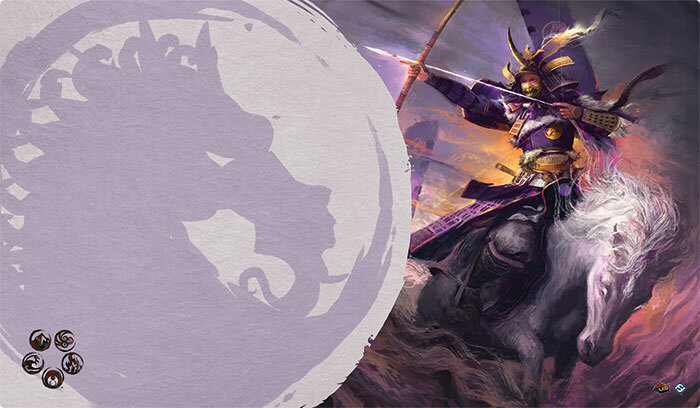 With massive armies and master tacticians, the Lion are well accustomed to dominating the martial aspects of Rokugan. Their newly risen Clan Champion is Akodo Toturi, and his wisdom may aid you on the field of battle. From their mountain monasteries and strongholds, the Dragon Clan watches the rest of Rokugan—carefully considering and intervening at the proper time. As a clan of mystics and monks, the Dragon may seem strange to other Rokugani, but they will follow their Champion, Togashi Yokuni, wherever he leads. The Crab Clan defends the Wall that protects Rokugan from the evil of the Shadowlands. With the great Hida Kisada standing like a stalwart bulwark at your side, few opponents would dare to assault your defenses. The spiritual guardians of the Emerald Empire are none other than the Phoenix Clan. 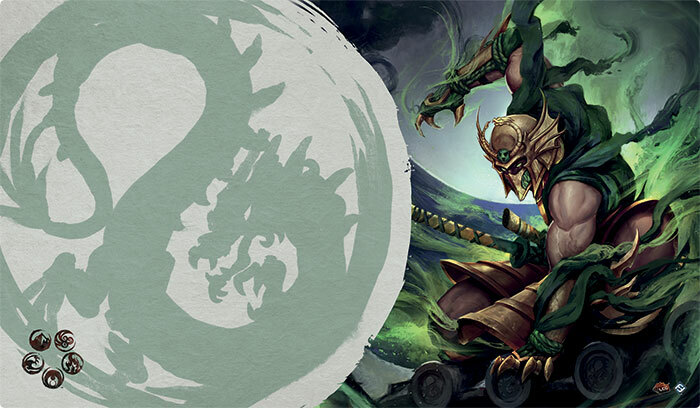 Shugenja are common among this clan, communing with the kami to maintain elemental balance in the world. Their Champion is Shiba Tsukune, newly chosen by the Soul of Shiba to lead their clan. The Unicorn Clan has dwelt in Rokugan for over two hundred years, yet for many, they are still regarded as outsiders with strange traditions. Their clan may face troubling times ahead, but with their meishōdō “name magic” and their Champion, Shinjo Altansarnai, they are ready to face the world. If any clan is the true power behind the Chrysanthemum Throne, it is the Scorpion. Their Champion, Bayushi Shoju, holds massive influence over the courts of Rokugan—and few would dare to cross him. As the Scorpion, you will do what others will not… all for the good of the Empire.